MKs, ministers praise committee report detailing legal means of preventing destruction of thousands of Jewish homes. Justice Minister Ayelet Shaked welcomed the conclusions of the Zandberg Committee - an interministerial team of lawyers which recommended a series of legal guidelines for regulating the legal status of thousands of homes in neighborhoods and outposts in Judea and Samaria. "The end of the era of uprooting settlements without purpose in Judea and Samaria, was led by a team that found legal ways to regulate settlements in Judea and Samaria and to end the shame of evacuating settlements for no real reason," Shaked said. 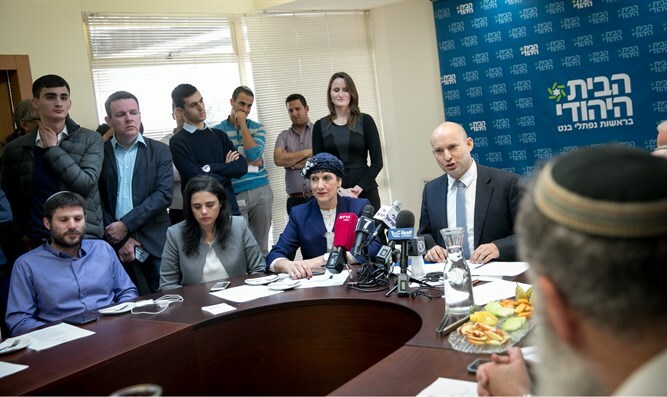 According to the Justice Minister, "the report gives legal tools that are compatible with international law, for the settlement of settlements in Judea and Samaria." Agriculture Minister Uri Ariel called on the prime minister to immediately adopt the Zandberg report and end the destruction of homes and communities in Judea and Samaria that were established with the encouragement and support of successive Israeli governments. "The Settlement Committee was established in order to find a solution for thousands of houses in settlements that are in danger because of petitions by radical leftist parties and the Palestinian Authority, which exploit the judicial system to harm and sabotage Jewish settlement in Judea and Samaria," Ariel said. "The report sets before us, the government, the simple truth that it is possible and necessary to settle settlement in Judea and Samaria after 50 years of settlement," he said. "I call on the prime minister to immediately adopt the report and put an end to the unnecessary and painful demolition and destruction of homes and settlements in Judea and Samaria established with the encouragement and support of successive Israeli governments." MK Bezalel Smotrich (Jewish Home) also called on Prime Minister Netanyahu to adopt the conclusions of the Zandberg Report. "The Regulation Law and the Settlement Team are very important solutions for the settlements. I call on the prime minister to adopt the conclusions of the report immediately." Nadav Shragai of Yisrael Hayom reported Friday morning that the Zandberg committee had submitted its recommendations in a 200-page report to Attorney General Avichai Mandelblit, Justice Minister Ayelet Shaked, Defense Minister Avigdor Liberman, and Agricultural Minister Uri Ariel. Attorney General Avichai Mandelblit has already informed the Supreme Court that he intends to follow a number of recommendations from the report, which found legal ways to prevent the destruction of 7,000 structures in Judea and Samaria. The members of the committee note that their solutions to allow thousands of Jewish structures to remain in Judea and SDamaria are in line with the Supreme Court rulings and clarify that they adhere to three principles: strict adherence to the rights of Arab residents in accordance with the rules of international law.